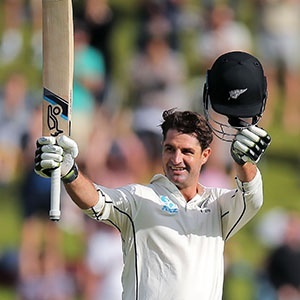 Wellington - New Zealand all-rounder Colin de Grandhomme cracked his maiden Test century off just 71 balls to leave the West Indies reeling at stumps on the second day of the first Test in Wellington on Saturday. It was the ninth fastest Test century of all time as de Grandhomme, in only his seventh Test, made light of a tiring attack and plundered the boundary on a demoralising day for the West Indies. At stumps New Zealand were 447 for nine, holding a 313-run lead after the West Indies were rolled for 134 in their first innings. De Grandhomme was out for 105 after a rollicking innings that included three sixes and 11 fours. Senior batsman Ross Taylor and Henry Nicholls set the stage for an all-out attack with their 127-run stand for the fourth wicket which led to de Grandhomme and Tom Blundell adding 148 for the seventh. There was no sign of nerves from the debutant Blundell who was unbeaten on 57 at stumps to go with Taylor's 93 and 66 for Nicholls on a day in which New Zealand scored 362 runs, lost seven wickets and left the West Indies exhausted. De Grandhomme, who went to the crease when Nicholls was dismissed on the second ball after tea, used the first delivery he faced from Miguel Cummins as a sighter and then smacked boundaries off the next two. It was big hitting with minimal risk as he raced to 99 and then reached his milestone century steering a Cummins delivery wide of point for three. But in the following over he was deceived by a slower ball from Roston Chase which was chipped to Kieran Powell at long on. Taylor was closing in on his 17th century to equal the New Zealand record held by his mentor, the late Martin Crowe, and current captain Kane Williamson, when he fell lbw to Kemar Roach shortly before tea. The initial appeal was turned down by Australian umpire Rod Tucker with two noises heard as the ball went through suggesting a possible inside edge. But the West Indies were confident in their call for a video review which clearly showed only the pad had been hit and the ball was angling towards the stumps, meaning Taylor's 160-ball innings was over. Nicholls had a reprieve on the third ball after the lunch break when he was caught behind off a poorly executed pull shot, only for video replays to show the Jason Holder delivery was a no ball. But there was no such luck on the second ball after the tea adjournment when he connected with the pull shot only to steer the ball to Shannon Gabriel who fumbled the catch at fine leg before securing it on the second attempt. After resuming the day at 85 for two, Jeet Raval was the first wicket to fall when he was caught behind off Roach for 42 in the 10th over of the morning while Taylor went nine overs before tea. For most of the day Windies skipper Jason Holder placed defensive fields with a limited cordon behind the stumps as he employed the short-ball tactics which had worked to good effect for New Zealand the previous day when Neil Wagner took seven for 39. The most successful of the West Indies bowlers was Roach with three for 73 while Cummins and Chase and two apiece.